What is increasingly the key ingredient of effective leadership in this new era of massive connectedness? The answer, quite simply, is the ability to inspire others through great communication. The function of language is not only to communicate information, but also to bring about an effect on the people in our lives. Some words have the opposite effect. There are specific language patterns that show you are not yet ready to lead. Listen to how you speak and you will derive an insight into your own thinking but also your own ability to lead. “Um” is a filler word that makes the leader sound indecisive and inarticulate. The leader may use this word to express doubt or uncertainty, or to fill a pause when they hesitate while speaking. A leader may use this word so much that it becomes an unconscious pattern, and this can demonstrate that they are not sure what they are talking about. When the speaker uses “like” as a filler word, it shows their audience that they are incompetent and have poor communication skills. Filler words may seem natural in everyday speech, but leaders who want to make an impact should not be using them. Powerful leaders work hard to eliminate words such as “uh,” “well,” “so,” “er,” and “like” from their vocabulary so that their audience can focus solely on their message. 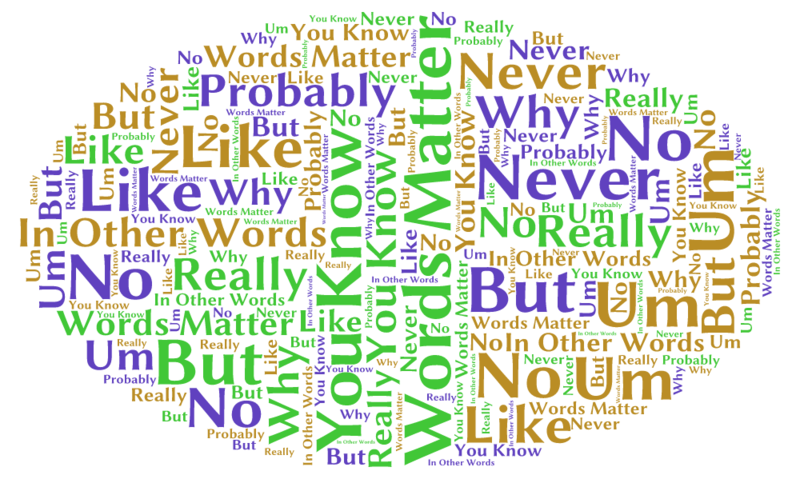 “You know” is another filler word that demonstrates low-quality thinking. When the speaker says “you know,” the truth is that their audience doesn’t know, and that’s why the speaker is telling them. The speaker is seeking some kind of confirmation from the listener. The speaker may hope to get at least a nod of the head, yet they instead demonstrate that they are not thinking about the language they are using. When the leader uses “really,” their team may not trust what is coming next. This is because the leader is making a poor attempt to instill candor and truthfulness in their team, and their team may question whether the leader is telling the truth. When the leader uses the word “but,” they negate anything that comes before that word. Therefore, the leader should replace “but” with the word “and,” or rephrase what they are planning to say. “Yes, but” is becoming the new “um.” The leader should practice using the word “and” until they can use it naturally as they speak. When the leader uses the word “probably,” along with phrases such as “I think,” “I guess,” and “sort of,” their statement sounds tentative, and they don’t express confidence or strength. In short, they are hedging their commitment to an idea. If the leader doesn’t believe in what they are saying, nobody else will, either. Why does the presenter need other words? Aren’t their original words sufficient? When the presenter uses the phrase “in other words,” their statement lacks clarity and conciseness. “In other words” also allows the presenter to drone on. If the presenter has new information to add, they should not use “in other words,” and instead deliver the new information. Additionally, if the presenter is using “in other words” to deliver a redundant statement, they are wasting the audience’s time. A flat out “no” can create a result that is negative. Nobody likes to hear the word “no.” Instead, the leader should try to use the phrase “I wish I could,” “let’s take a look at this and see what else it impacts,” or “that’s one option; let’s look at a few other options.” Sometimes, just saying “no” can be clear, but it can also leave the team with a limiting perception of the leader that is not useful. If the leader softens the word “no,” they get the job done and leave their team with the impression that the leader was open to exploring options. 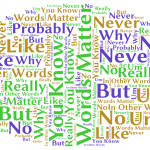 How you say things, the words you use, and even your perceptions about the meanings of words do matter. At the most concrete and practical level, demonstrating leadership is about language. A transformation can occur in your thinking when you change your language. Changing the words you use will allow you to engage people in particular conversations that can have the ability to create an alternative future. This is leadership in action.